So your MacBook Air screen cracked? This issue is not uncommon. 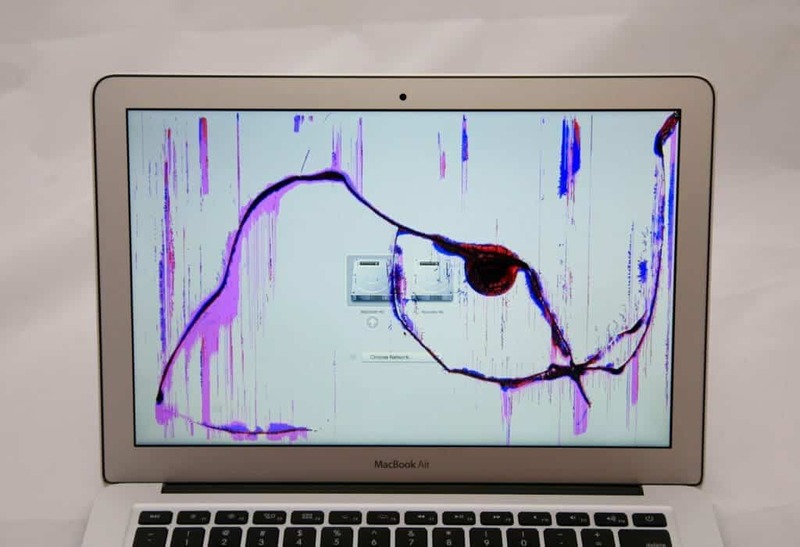 You can find accounts of the MacBook screen cracking by itself on Apple’s own forums as well as MacRumors, and others. A crack is only formed by some sort of force, but the amount of force and the type of force that causes a crack can vary a lot. On some models only a little bit of force is required if applied just right to crack the LCD panel of the Mac. The models that seem to crack the most with the least amount of force are the original MacBooks (white and black models), and the MacBook Air series. While both of these models still require some sort of trauma to crack the screen, in our experience they require less trauma to crack on average than the MacBook Pro line of laptops. Sometimes when the computer comes in we can see where the impact point was that caused the damage to the LCD, other times, it does appear the screen started to crack from a kind of twisting motion. On some model computers, including the MacBook Air, the screen’s LCD panel is so thin, and the metal housing is so thin, that it allows some bend in the display when opened or held by a corner. The LCD panels are extremely brittle, so this slight bending can cause the LCD panel to crack internally. We sometimes hear this happens when the computer is placed in a backpack that is a little too full, or is opened and closed by a corner instead of the middle, and sometimes it just seems to happen without any external influence at all. 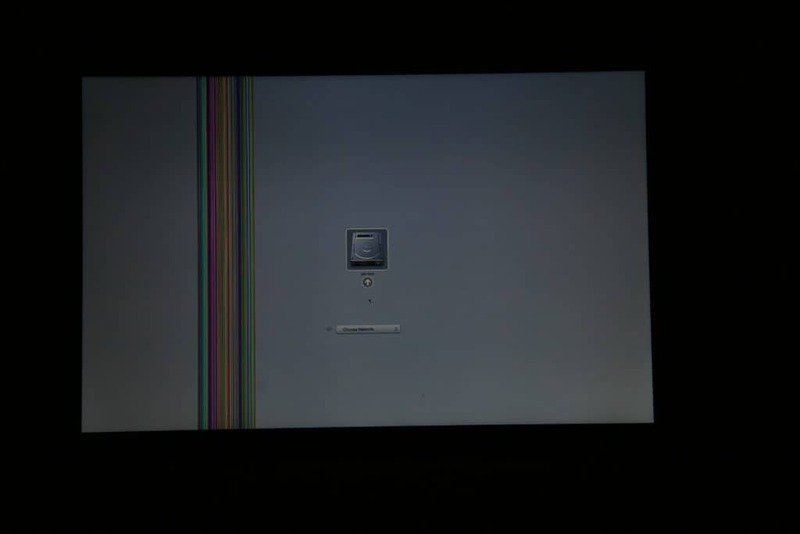 Another scenario that can cause the belief that the computer cracked by itself is when a very small, not noticeable, crack has formed from a hit, drop, or twist, but the small crack in the LCD remains so small it is not visible for some time (hours, days, weeks, you get the idea). Then at some point something finally causes the crack to expand (a lot like a windshield crack will expand in cold weather, after going over a bumpy road, etc). It appears that a perfect screen just suddenly cracks without any external influence, when in reality there was a small crack that was just made worse by something that normally wouldn’t cause any trouble (changing temperature, adjusting the screen, or a ride in a full backpack). There is another form of screen damage that is more common on the MacBook Air models than other models that causes a vertical bar on the screen. This damage is caused by a failing ribbon cable that is part of the LCD panel. When the ribbon cable begins to pull off the connection, it causes a bar as the one shown below. Unfortunately the only way to repair this issue is to replace the entire LCD panel rather than just the damaged cable. Apple has now started to offer AppleCare+ for newly purchased Mac computers. If you have a laptop that isn’t going to just sit on a desk its whole life, I believe AppleCare + is a good investment. Apple has always liked expensive displays, but lately they are getting more and more customized and also more and more expensive. In the past Apple used basically standard display panels that you could find in other laptops (much like their hard drives, RAM, etc), but now they are using more customized designs and connections so finding replacement displays for less than Apple sells them is becoming more and more difficult. I think this trend is here to stay as it allows Apple to have greater control over the Apple repair sector. No matter if your MacBook screen cracked by itself or if it was hit by a falling healing stone (yes, that did happen), we can help you get it back into working condition with a new screen. Rather than getting your MacBook Pro screen replacement at the Apple store, check out our reviews and let us help you get your computer working again as quickly as possible. We offer affordable Mac repair for everything from damaged screens to liquid damage to data recovery. With thousands of MacBooks repaired, we are experts. We do MacBook screen replacement. We get dozens of Macs with broken screens in our shop each week. Each one is a little different. 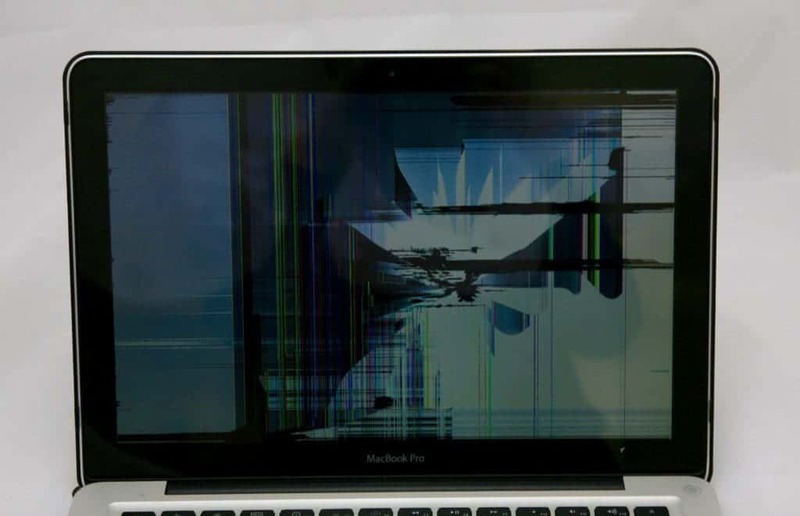 People often ask us, “how can I tell if my MacBook screen needs to be replaced?” Usually, damage to the MacBook’s LCD panel is pretty obvious. 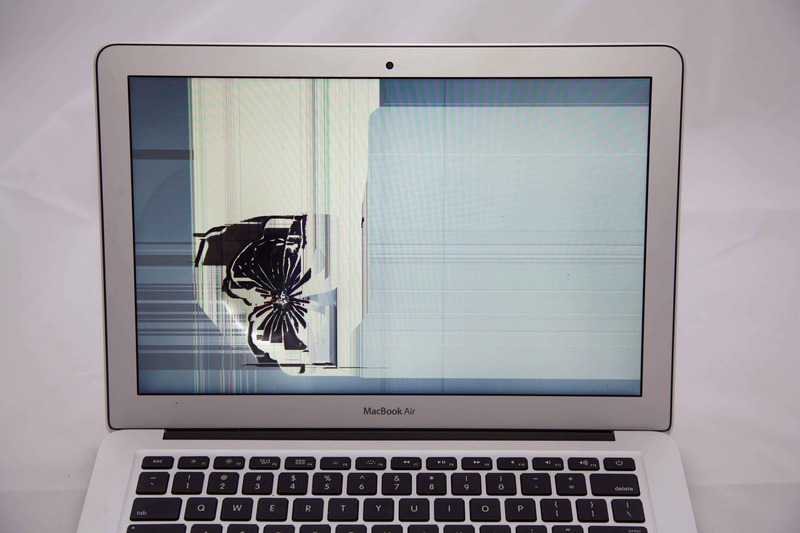 There are a few common signs of cracked LCD panels. For examples, check out some of these recent repairs that we’ve worked on. This little 11 inch MacBook Air has a pretty messed up looking display. It is definitely in need of our MacBook screen replacement. At first you might think there’s something wrong with the video card, because only half of the screen is showing the background image. There is a black bar splitting the display exactly in half. There are multicolored vertical white and rainbow stripes covering the right side of the screen. If you look closer, you will see the jagged purple line in the bottom corner. It’s likely this MacBook Air A1466 was damaged along the bottom right, under the bezel. It might have gotten pinched too hard there while it was being moved, or maybe the screen was closed on an object. If something similar has happened to you, don’t feel too bad–it’s very common! If your screen looks something like this, even if you don’t think it has been cracked, it’s probably a damaged LCD panel. Another way to test is to try hooking the laptop up to an external monitor. If the picture looks normal on the external display, then you know the problem is with the LCD panel. 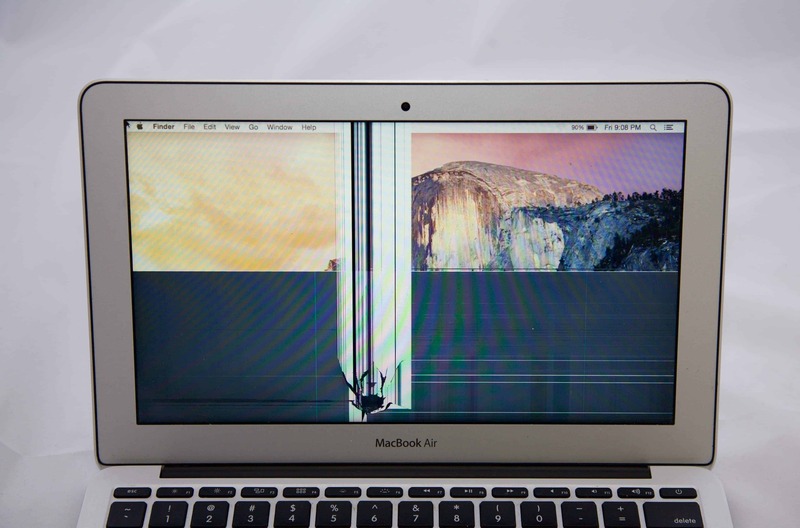 We have you covered with our MacBook screen replacement. This is the service you would need for your MacBook Air computer. This larger MacBook Air computer has a crack located in the upper right corner of the screen. There are also bars and lines covering the display on this laptop, but they are mostly horizontal instead of vertical. 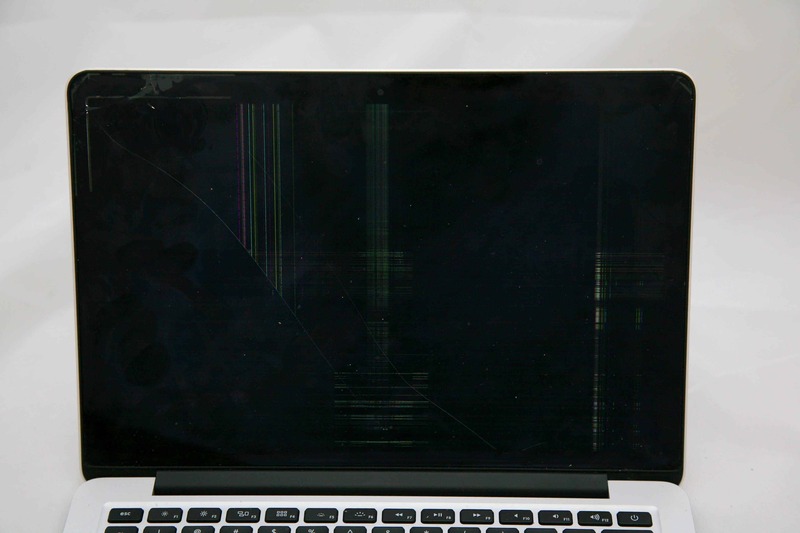 A broken LCD panel can cause either horizontal or vertical lines to appear across your screen. There’s no question about if the lines are caused by the LCD or another malfunctioning part, because the impact point is clearly visible in the corner, with a “bleeding” purple shatter mark. This 13 inch MacBook Air display could have been hit to either the front or the back of the screen. There is no glass on the front to break, so only the LCD panel needs to be taken off and replaced with a new part. MacBook screen replacement restored this sad piece of technology back to its original, happy state! Since it’s a larger screen than the 11 Inch MacBook Air, the LCD is a little more expensive, but still cheaper than replacing the whole display. Don’t be fooled by the green and pink lines on this screen–that’s just from the camera we used to take the photo. For some reason it’s harder to take a picture of a working MacBook screen than a broken one! This A1278 MacBook Pro has an inch long crack along the left side, on the black part of the screen, but only the glass was damaged. The LCD underneath is intact and functioning perfectly. It’s showing a light grey background with no marks, lines, or splotches at all, just as it should. What we do see is just some feathery cracks across the front from the broken glass. But the picture underneath is totally normal. On this Mac, we can replace just the glass part. It’s possible to keep using the computer with the broken glass, but there is a good chance the problem could get worse. You might even cut yourself on the glass shards. Replacing the glass isn’t too expensive. Through our MacBook screen replacement service, we can change the glass and leave your original LCD panel. Finally, we have another MacBook Air, the same model as the first one above and a few years newer. Even though this MacBook Air’s screen looks a lot different from the other, the problem is the same–LCD damage. The impact mark is on the right middle of the screen, and instead of lines, we see inky black blobs leaking along the cracks. Depending on how the cracks go, the malfunctioning pixels can display all kinds of weird shapes and colors. The fix for this computer is exactly the same as for the first one–a new LCD panel. 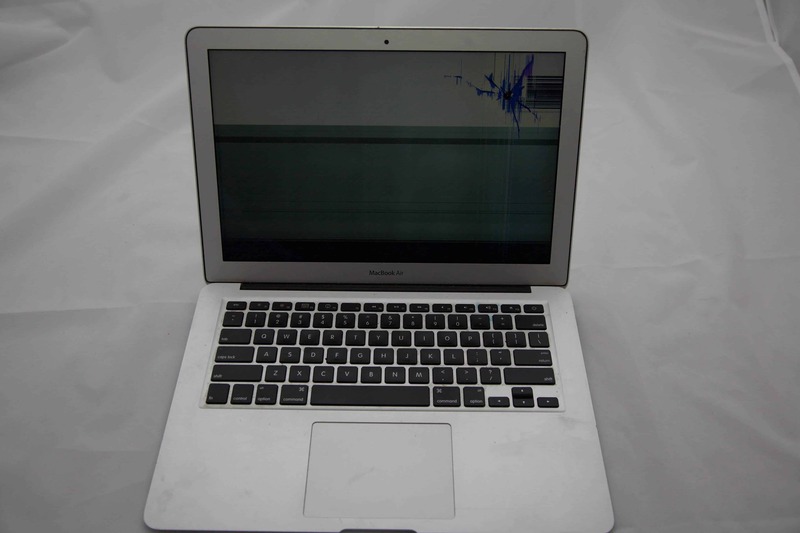 Our MacBook screen replacement service is able to meet your needs. 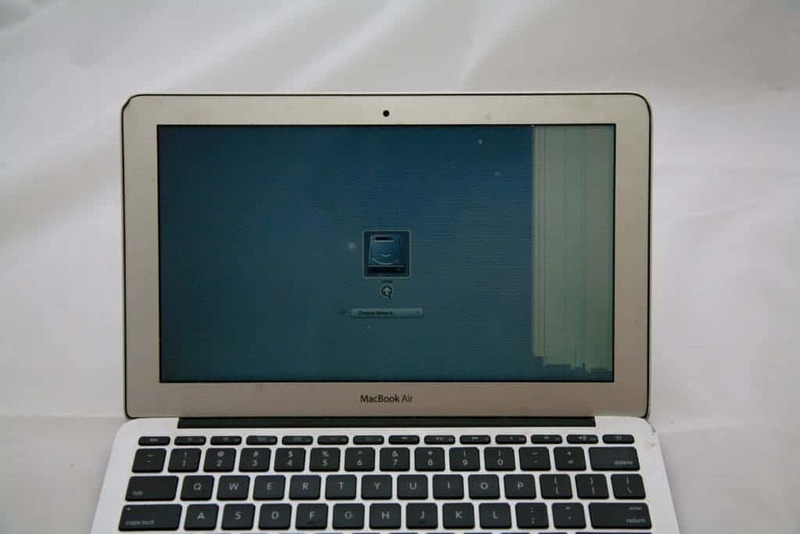 We specialize in MacBook Air screen repair. We have an industry leading 24 hour turnaround, and competitive pricing. If you have a broken screen on your Mac and are unsure what service you need, please fill out the form below and we will get back to you within a few hours. We offer cracked screen repair through replacement of your LCD panel and/or glass screen, depending on whichever is damaged. This cracked screen below looks pretty bad, with the horizontal and vertical colored lines and “shatter” image covering most of the screen. This type of cracking is common when the computer is closed on a small object like headphones. But we say this Mac was lucky, because the glass panel on the front of the display is totally intact. For these Non-Retina models, the glass and LCD screen are separate parts. We are able to offer cracked screen repair for this model by replacing just the LCD panel and preserving the original glass face. You might notice that there is a plastic case on this laptop. Yep, screens can be damaged even if the laptop has a case! 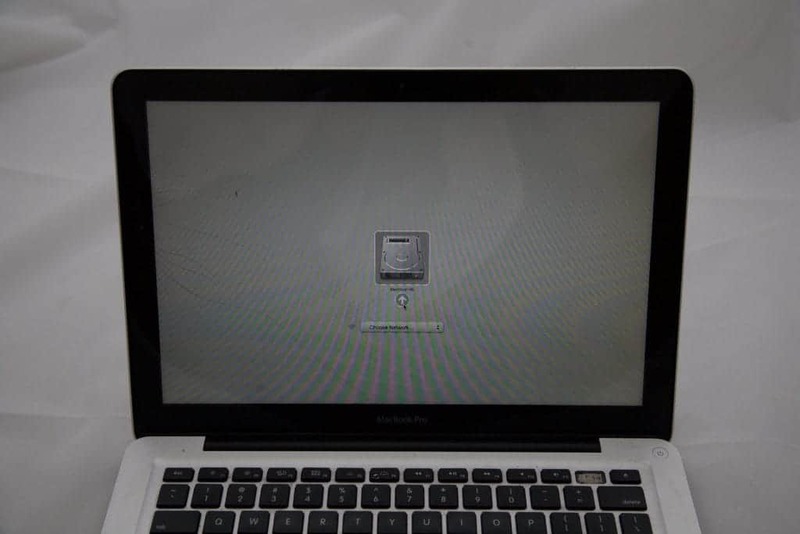 This 13 inch MacBook Pro A1278 was able to be repaired in under 24 hours for under $200. The newer Retina version 13 inch MacBook Pro has a thinner bezel around the LCD panel in the display, and doesn’t have the silver “MacBook Pro” branding at the bottom of the screen. Another easy way to tell the Retina models apart from the older unibody MacBook Pros is to look for the DVD slot on the side of the computer. The newer models do not have an optical drive. This MacBook Pro has several cracks across the surface of the screen diagonally, you may be able to see them in the photo, they look like hairline fractures under the glass. These cracks cause discolorations on the display in the form of vertical and horizontal lines, and blurry colors. 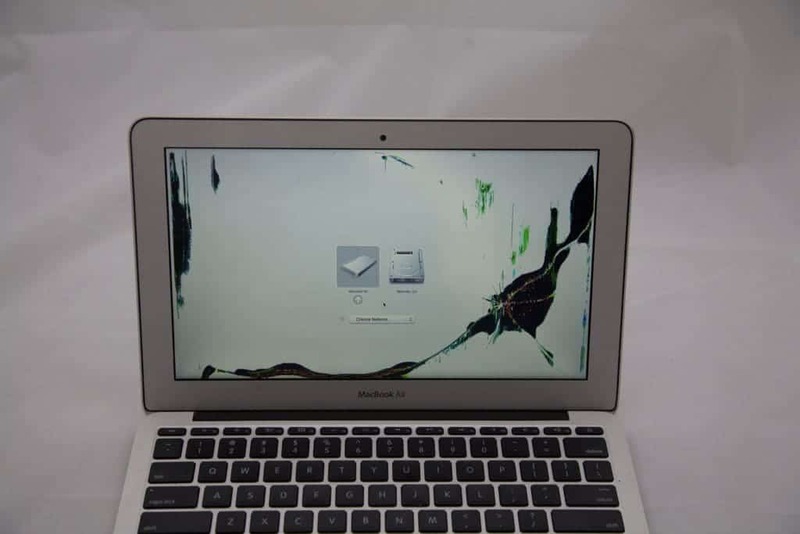 For this laptop’s cracked screen repair, we replaced the entire screen as one piece for a great looking result. We also offer fast and affordable screen repairs for MacBook Air computers. 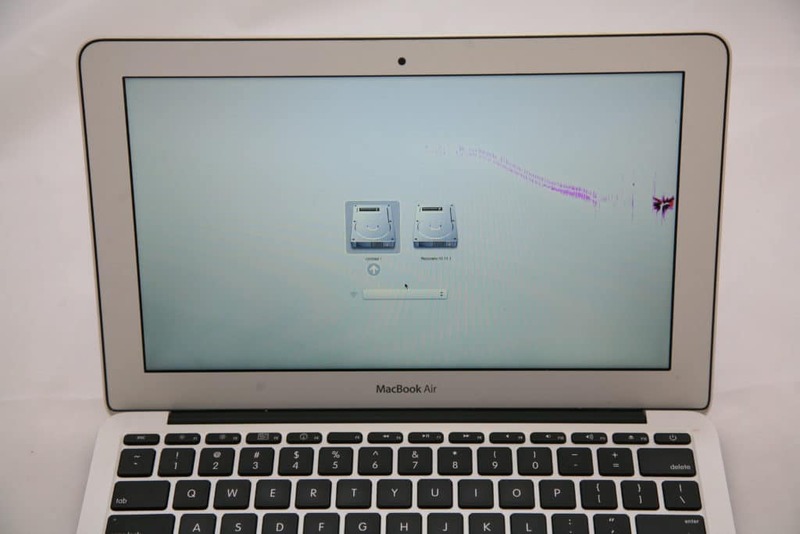 Here’s a 2013 13 inch MacBook Air with pink and purple bleeding on the screen from a cracked LCD panel. The cracks are internal, so the surface of the screen will seem to be smooth, but the blobs and colors on screen are a clear sign of LCD problems. It might look like the front of the computer was colored on by a toddler with a marker, but really this laptop was shut with a single Skittles candy left on the keyboard. Oops! Simple accidents can easily break the screens on these thin and light laptops. 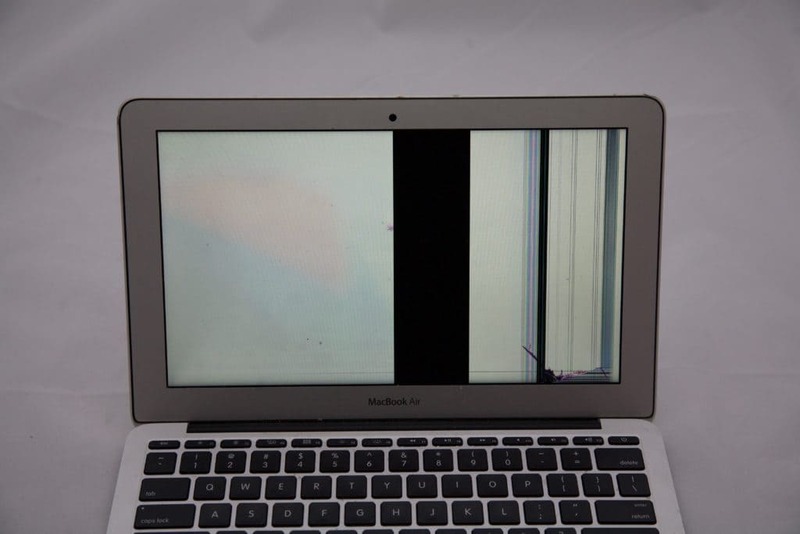 Here’s a broken LCD on the above Air’s smaller cousin–the 11 inch MacBook Air. As you can see from the small dent on the upper left corner, this little Mac has had a rough and tumble life. However it’s actually the tiny crack in the bottom right corner that is causing the lines and white bars on the screen. The small crack wasn’t too noticeable at first, but got worse over time. The solution to this problem is removing the damaged LCD panel and installing a brand new LCD. This service is much more affordable than a new display assembly, or a new MacBook Air. We love getting these neat little computers fixed up and back to work through our cracked screen repair service.